Smoking Sutliff's Bosphorus Cruise in my Bianca 307 bent bulldog. Louisiana Red w/ sweet iced tea. Finally home after an arduous day. Just finishing this bowl of D&R Penhooker Silver in an early smooth Radice Tiger Eye G medium bend pipe with a bamboo-style carving on the shank with a black acrylic stem. Now smoking Amphora Virginia in a brown straight smooth Paul Perri billiard with a black acrylic tapered stem. Deciding on what to watch on TV. Now smoking Wilke No. 178 in a 1980s straight smooth Big Ben pot with a nickel band and a black vulcanite stem. Watching "The Gilded Age" on PBS. Half way through this bowl of Wilke Surburg’s 71th Street in a 1979 no name French briar smooth full bend egg with a black vulcanite stem. Last smoke of the day is Edgeworth Ready Rubbed Match in a 2002 smooth top, black sandblasted quarter bend Karl Erik Ekstravagant horn with a horn insert in the ferrule and black acrylic stem. my Fe.Ro pipe with Ilsteds Own 100 and my cup of coffee for than man. Half way through this bowl of Edward G. Robinson's Pipe Blend in a 2014 Basil Meadows smooth slight bend squashed tomato with an aluminum band and a black pearl acrylic stem. Simply Apple is my drink. 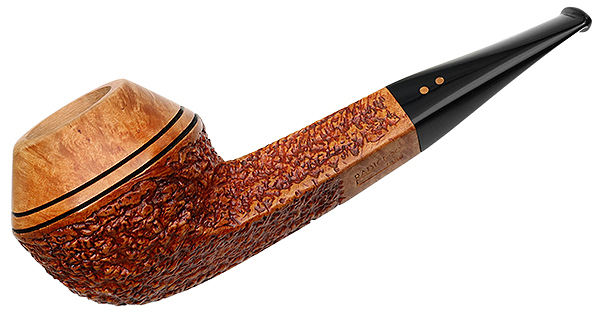 Smoking HU Old Fredder’s Broken Flake in a smooth straight early 1960s Lane era Charatan Executive Extra Large stretch apple with diagonal channel cuts on the lower right and left of the bowl along with a black vulcanite double comfort stem. This pipe was formerly owned by actor William Conrad. A can of the very delicious Hansen's Mandarin Line soda made with pure cane sugar is my drink. 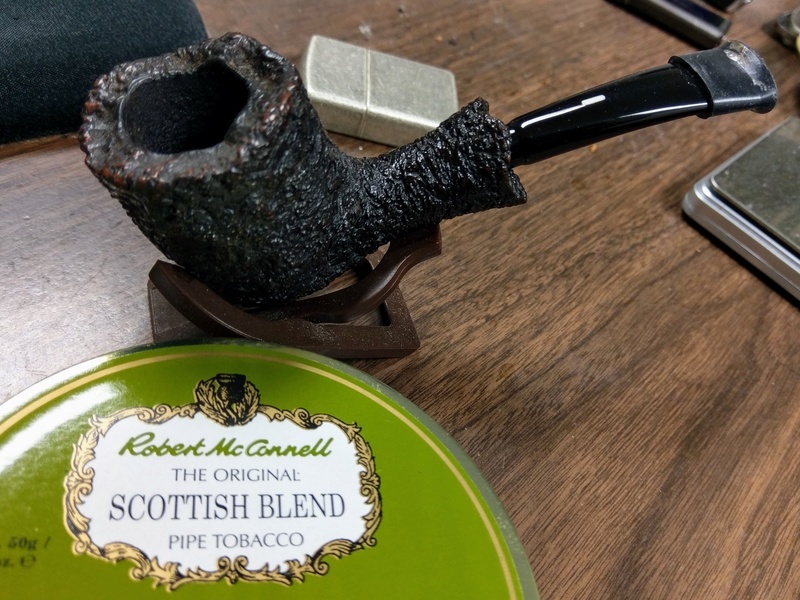 Almost half through this bowl of MacBaren Mystery Blend in a 1982 smooth straight Dunhill Root Briar 31051 Dublin with a black vulcanite stem. It's one of the upcoming new MacBaren blends, and no, I can't say what it is. I'm liking it though. A minute or so away from smoking MacBaren Virginia Flake in a straight smooth patent era 1952 Dunhill Bruyere ODA apple 806 B124 with a black vulcanite stem. Ice tea and bergs is my drink. Just finishing this bowl of McClelland Oriental Mixture No. 8 in a 1982 black sandblasted medium bend W.O. Larsen freehand with a black vulcanite stem. Now smoking 2012 Virginia Spice in a 2004 smooth long shank Canadian Trever Talbot Ligne Bretagne Faite en Bretagne 4/3 with a black vulcanite stem. Ice water and bergs is my evening drink. C&D Bluegrass in a medium bend raw sienna toned early Radice sandblast egg with bamboo carving on the shank and a black acrylic stem. Relaxing after a wonderful Greek pasta dinner along with two slices of m'lady's egg custard pie. Am a quarter of the way through this bowl of MacBaren Mystery Blend in a 2018 smooth straight flame grain Basil Meadows Merchant Service "Bing" replica with an aluminum band and black ebonite stem. Watching the Braves-Nats game. Now smoking Motzek Highland Balls in a 1980 medium bend black sandblasted silver band Peterson Donegal 805 Bulldog and a black vulcanite p-lip stem. Hate the name of this blend. Just finishing this bowl of Motzek Kieler Freunde “Alte Hasen” in a 1970s smooth medium bend Stanwell Rego 969-48 Design Choice 837 sitter with a vulcanite stem and ferrule. 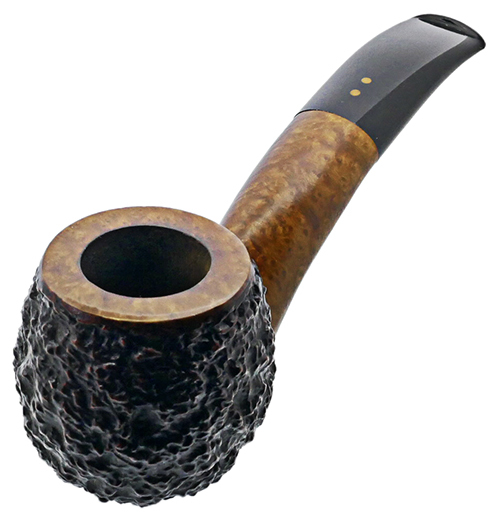 Now smoking Rich Dark Flake in a straight sandblasted black billiard 2013 PSF POY Kaywoodie with an amber colored lucite stem. Have enough for about a bowl. Watching The Shadow.